As we approach the apex of the 2016 US Presidential Election, it is almost impossible to escape election related content on social media. One of the more recent content-trends is for Facebook pages to create live polls via Facebook’s live streaming platform - Facebook Live. User are asked to vote for their preferred candidate with Facebook Reactions. In the scenario below; users would “like” for Trump and “love” for Clinton. Variations of the trend have been posted by a number of large pages, including Comfort, AVO Comedy and click-bait kings - UNILAD, who have over 20 million Facebook likes. 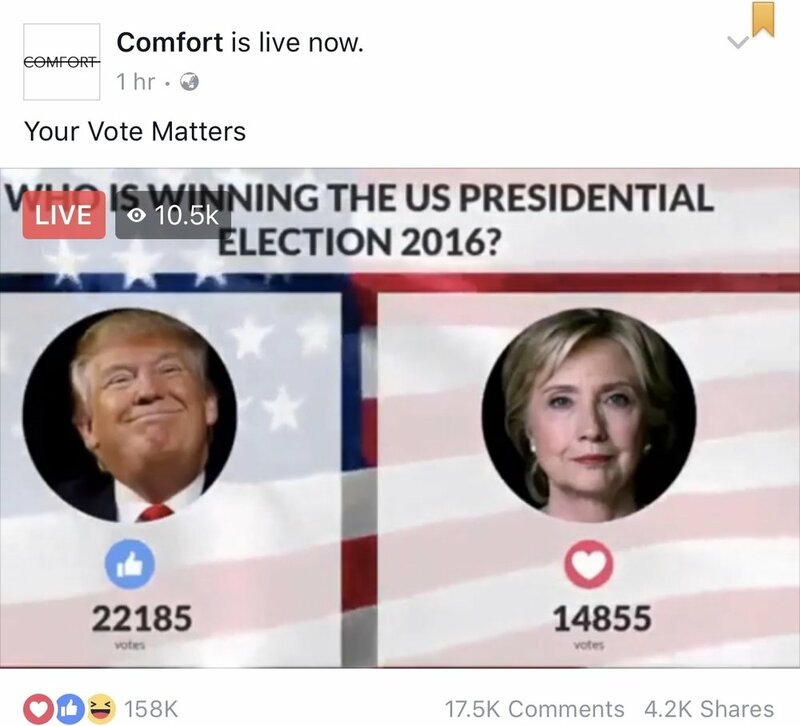 A live poll by Facebook page - Comfort. Despite Clinton being ahead in most major polls, almost all of the live streams that I have come across show Trump as being ahead in votes. And as is shown in the screenshot above, Trump is often doubling Clinton in votes. Being perplexed by the results, I went and did some further investigation and discovered that the majority of these live streams were not as democratic as one might think. Upon looking at Facebook’s metrics tool, it became apparent very quickly that the “votes” for each candidate were not actually being determined by the reactions and were instead predetermined by the page that was posting the live stream. As you can see below, a live stream posted by Facebook page Donald Trump My President, shows two very different sets of results. According to the figures in the video, the poll finished with 11,086 votes for Trump and 7,422 votes for Clinton. In comparison, Facebook’s own tool reports 56,000 votes for Trump and 4,600 votes for Clinton, this means that the page fabricated an extra 2,800 Clinton votes and did not account for 45,000 Trump votes! The votes that were displayed on the live stream. It is worth noting that the above screenshot was taken 4 hours after the live stream had finished, and given the fact that you cannot view these metrics as they happen, Facebook’s metrics represent an extra 4 hours that the video does not account for. While this extra 4 hours could explain the unaccounted 45,000 votes for Trump, it cannot explain the missing 2,800 Clinton votes. 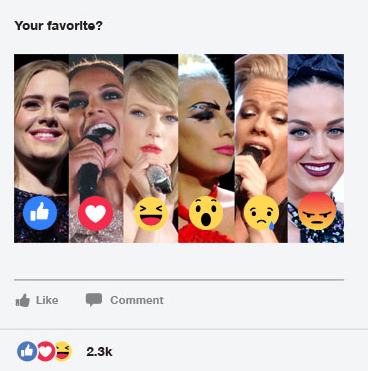 A Facebook page uses a static image to ask users to vote for their favourite pop artist with reactions. While Facebook is currently trying to reduce clickbait, Facebook is also heavily promoting it’s relatively new live video feature. Facebook is doing this by making live video more accessible in the newsfeed and by sending users notifications when a page that they have liked is live. As a result, using Facebook Live is a sneaky way for clickbait pages to get around Facebook’s current crack-down on clickbait. The fake “vote count” can be easily seen in the thumbnail, which increases engagement rates. The live comments section means that there will be more users viewing (and arguing about) the post in real time. By putting Trump ahead in the polls, Facebook users (like myself) are surprised when they see the fake vote count, this increases engagement rates. Over 50% of Facebook’s users only access the platform on mobile, this is important because when viewing a Facebook Live video on mobile, you cannot look at Facebook’s metrics until the live stream has finished. As a result, mobile users cannot cross-check the votes that the pages are claiming. It would be far easier to create a video with two fake numbers than it would be to create a program that would pull the real numbers from Facebook and put them into a live video. Facebook now notifies users when a page that they have liked is live. While I have only been able to find evidence of the live stream voting trend in the last week, it has already begun to morph away from the election. 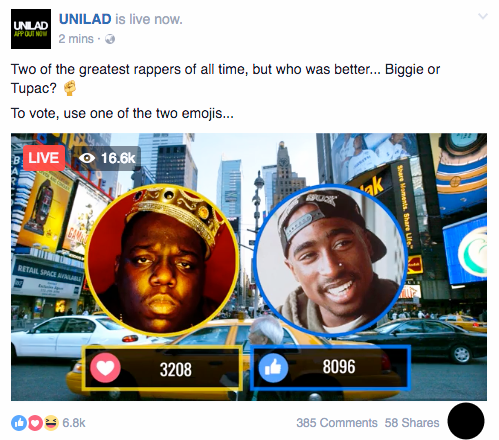 Facebook page UNILAD recently asked it’s followers to vote between rappers Biggie and Tupac. In contrast to the live polls posted on other Facebook pages, UNILAD’s poll actually seemed to be displaying the correct information. Given the high engagement rates that these posts receive, It is a highly likely that we will begin to see even more of of this live stream voting trend in the near future - with or without fabricated results. Facebook page UNILAD asks it’s followers to vote on their preferred rapper. This isn’t the first time that Facebook users have been duped by Facebook Live videos. In recent months, pages such as USA Viral and UNILAD have been guilty of reposting old content as live stream videos. Most recently, Viral USA live streamed a video of a man climbing a 1,999 ft. tower - it turns out that the video was over a year old. Viral USA received approximately 6,000,000 views for their live stream, while the original YouTube video has a comparatively modest 750,000 views. Given the current content shift towards video, and the still relatively immature platform that is live streaming, it will be interesting to see how content creators continue to use the platform in innovative ways. And if and consequentially how platforms like Facebook plan to moderate misleading content like the live voting trend.